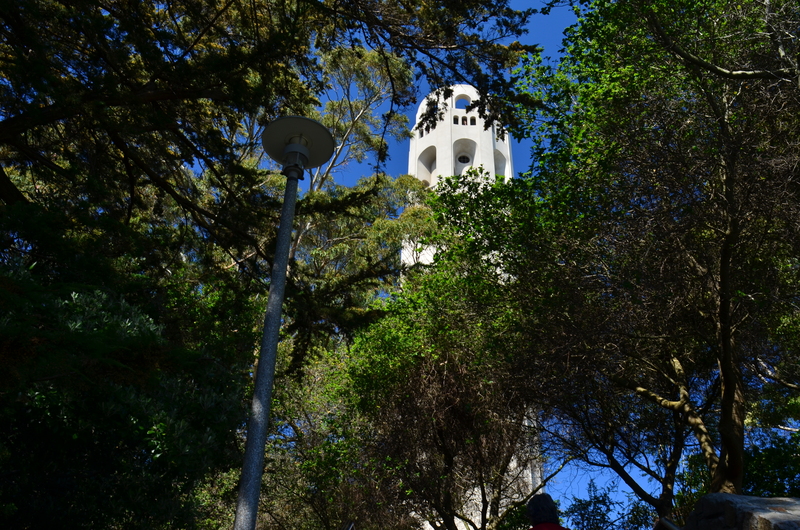 The final approach to Coit Tower is shielded by a dense shroud of trees. OF THOSE WHO REGULARLY BRAVE THE KNEE-CRUNCHING, 275-FOOT TREK up San Francisco’s Telegraph Hill, a promontory in a city that is, itself, a sea of promontories, many make the pilgrimage for the privilege of filing into a circular tub of a mausoleum that houses the central core of Coit Tower. Since 1933, this white, streamlined concrete shaft, looking over the bay from atop the archly hip North Beach neighborhood, has been visible from anywhere in the greater SF area, now resembling a lighthouse, now looking more like the topper on some important tomb. Built in honor of a local character named Lillie Hitchcock Coit, who chased fire engines to local blazes and used her inherited wealth to fund a memorial to what we now call first responders, the 210-foot tower is, on the outside, the curiosity of but a few minutes. But inside, it’s a great place to watch people. People watching other people. People from every craft and trade on the earth, their vanished world enshrined in the brightly-hued murals that decorate the entire interior of the tower’s base. People who provide a visual encyclopedia of who we are, captured in the “whos” of what we were. 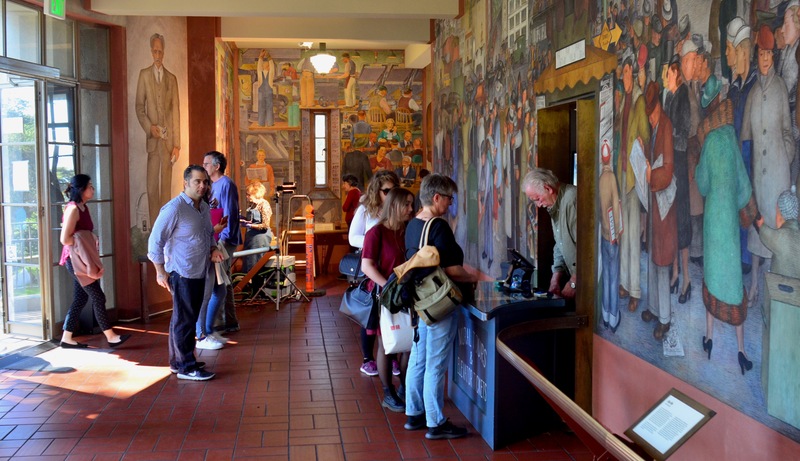 The mural-embellished lobby of San Francisco’s iconic Coit Tower. Note the touch-up artist behind the daily visitors. The America of the 1930’s was indeed a very different place, one groaning under the near-25% unemployment rate of the Great Depression. Solutions both good and bad abounded in the desperate atmosphere of the day, one such solution involving the idea of regarding the country’s artists as no less important than its workmen…that is, creating government programs to put them back to work. Sculpting. Painting. Writing plays, songs, novels, guidebooks. Recording photographic archives by which we better understand the bitter struggle of those years. A variety of “alphabet soup” acronyms like the WPA (Works Progress Administration) chose the projects and fronted the cash to make them happen. Think that over. We paid people to make art. In post offices. In libraries. In meeting houses and union halls and railroad terminals and theatres and auditoriums. Frescoes. Reliefs. Statues. Works with which our government announced, in a very loud voice, that Art Is Important. And that steps were going to be taken to keep it alive. Coit tower’s lobby is only one of dozens of places in San Francisco where public art was used for not only beauty but commentary. The people on the walls are not generals, nor political leaders, nor gods, but ordinary working people, shown in every trade from farming to construction. Fruit pickers. Meat packers. Librarians. Cowboys. Their majesty is in the very un-exalted way they are depicted. Generations later, they are still recognizable. As us. From us. One of us. Watching the daily crowds queue up for a ticket to the tower’s one slow Otis elevator is a little like watching a mirror. The types, from large to small, skinny to stout, match up. The faces of fresco and flesh melt together. The past and the present blend, as in the above image, where people visiting the monument for the first time pass unwittingly by a seated worker, tasked with repairing the wear and tear of salt air and time. Wheels turn.The work goes on. One day it’s mining. Next day, it’s coding. All work. From the top of Coit, visitors enter a time machine of a different kind, as San Francisco’s mad mix of Victorian elegance, Bohemian beat, and psychedelic scrawl unfold in a 360-degree panorama. But it’s the technicolor testimony at ground level that makes the building great, its factory workers, miners and coal miners anchoring the place in human effort. A good general source for learning about the Coit’s panels (which include work by many of Diego Rivera’s students), as well as the other projects that survive in the area is Depression-Era Murals of the Bay Area (Veronico, Morello< Casadonte, Collins, 2014), although a general study of New Deal-sponsored art programs will also delight even the casual student. So come for the climb. Or the tower. But stay for the stories, all the while taking pictures of people looking at people. And seeing something they recognize. This entry was posted on March 20, 2019 by Michael Perkins. It was filed under Americana, Architecture, Art Deco, California and was tagged with Coit tower, murals, WPA.